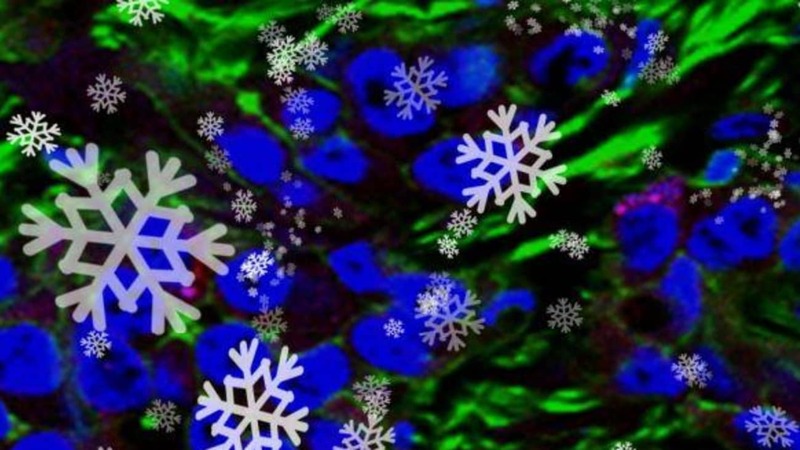 A protein delivery system, represented by the snowflakes, has been developed which specifically targets prostate cancer tumors. “Delivery, delivery, delivery,” Gao laughed as he describes a new technique which might finally deliver cancer-killing payloads to the prostate tumors in effective doses. Gao, in the University of Washington's Department of Bioengineering, and Eva Corey, in UW Medicine’s Department of Urology, seem to have found a way after working on the problem for six years. Their work is outlined today in Nature Biomedical Engineering. The researchers needed to create a delivery module that could get past the body’s immune system, and avoid positively charged ions so as not to attract negatively charged proteins in blood and cell surfaces, and, finally, deliver enough of the cancer-killing drug to tumor cells. In this study, the biologic agent, short interference RNA (siRNA), was transported by a ribonucleoprotein octamer capsule, which is shaped like an octopus. Gao compares the conventional DNA and RNA delivery systems of biologics to prickly cocklebur seeds, which stick to everything they touch. In the existing DNA/RNA delivery systems, the positive charges act as the burrs on the seed as the protein floats in the body. Creating a GPS to guide the tumor-killing payload was achieved by adding a molecule that binds to a designated receptor on the tumor. The carrier itself was slightly negatively charged, which separates this technology from virtually all previous delivery mechanisms, Gao said. This is also why past delivery vehicles—think again of the cocklebur seeds—cannot be guided to specific cell types even with targeting molecules acting as a GPS. Capsules with positive charges still bind to all cell types, without selectivity, he noted. Moreover, the group used material derived from human proteins for the shell of the capsule so the body wouldn’t attack it. On top of this, the team had to figure out how to bind enough of the payload material, the siRNA, to the capsule so it would effectively kill the tumor. With this capsure, they bound the killer agent to the outside of the capsure instead of putting it inside. The siRNA was delivered in amounts enough for “significant” efficiency in killing the tumors in the mice tested in the project, results showed. The RNA, in practical terms, ordered the genes that support tumor growth to commit suicide, Gao and Corey confirmed. The development of this nanocarrier capsule seems to overcome the issues faced by existing DNA/RNA delivery mechanisms, according to the researchers. "There are limited treatment options for patients with advanced prostate cancer and new effective treatments are needed," Corey said. "Targeted delivery of sufficient payload of siRNA to kill specifically tumor cells might truly provide new avenue of effective treatments.All solid tumors, including prostate cancer exhibit significant tumor heterogeneity; between patients and even between different metastases in a single patient. "So there is not going to be “a magic bullet” that will kill all tumor cells," she added. "The great advantage of our new delivery system is that it can be easily modify to have different GPS – target as well as different molecular targets for killing the tumor cells. Therefore it could hit multiple tumor phenotypes, and that is true not only for prostate but other solid tumors as well." Next steps include seeking pharmaceutical collaborators in developing siRNA drugs to bring this delivery technology to clinical translation, Gao said.